I’m sure at some point in your life you’ve heard the phrase, “If you build it, they will come.” It’s from a 1989 Kevin Costner movie called “Field of Dreams” and it’s totally relevant for today’s post. Odds are you’re like me and have never seen the movie in its entirety but, you’ve heard your dad/uncle/older brother say that quote more times than you can probably remember. Most people use this quote when referencing building a new product or service in their business. It comes from the idea that if you can identify your customer's pain point and offer a solution then you’re chances at organic business success greatly improve. Maybe that’s the case every once in awhile but, if you’re an entrepreneur struggling to grow I can say that 99% of the time that saying is total bunk. Real life is not a baseball diamond in the middle of a farm field where ghosts of players show up and everyone has a grand old time. In fact, if you’re building into a physical space hoping new customers will come you are in for, probabilistically, a world of hurt. This is a problem that I see all the time. I see business builders getting really excited about their ideas and solutions jump into an over leveraged buildout hoping that a grand opening celebration will solve their cash flow issues. Then, when it doesn’t, scramble to figure out how bills are going to get paid while trying to simultaneously drive more traffic through the doors. It’s a really tough situation to see and a tougher situation to be in if you're the business owner. So, when do you know if jumping into a new space or investing a bunch of time and money into your current space is worth it? By keeping these concepts in mind. 1.) Are you beating obscurity? If you’re business wasn’t getting any attention before your new space why would jumping to a space change that? Odds are it won’t. Taking stock of your business’ audience and community is a great place to start. Are people showing up at your events? Interacting with you on social media? Leaving you great reviews and testimonials? Coming back as a paying customer on a regular basis? Being able to leverage a real and engaged community is going to be critical if you hope to see real bodies in your space when you open your doors. 2.) Do you have enough revenue to support a space? There are some expenses that you have to make when you’re starting a business. Building a website, getting business cards possibly investing is some kind of inventory/customer management system all qualify. These expenses, while potentially significant, are all flexible in terms of when you choose to incur those expenses. You know what isn’t a flexible expense? A long term lease payment. Well, that and all the other fixed expenses that go with buying into a new physical space. If you’re just starting out, struggling to grow or have really inconsistent sales why would you commit to a long term expense? Using some credit to finance expansion is great only when you can, with some minimal level of certainty, predict what your revenue is going to look like in the future. And no, just because your five year plan says you’ll be profitable in six months doesn’t mean the market you’re serving thinks the same thing. 3.) Will your customer’s tastes and expectations be changing any time soon? Opening the doors on your shiny new business space is a great feeling. The fact that that your customers are walking through your doors, engaging with you, buying from you and walking out getting the solution you’re offering them is why you chased the entrepreneur feelings in the first place. Will those feelings last though? How much research have you done on the disruption that could be happening in your market space? 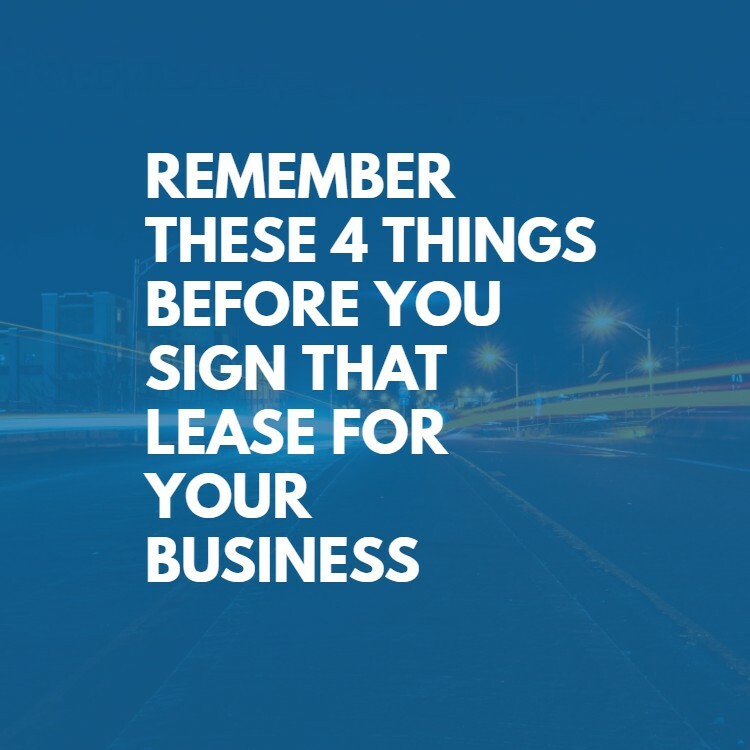 Can reasonably expect consumers to maintain their buying habits for at least as long as you have your lease? Transportation and medical aren’t the only industries that are subject to disruption anymore. Everyone knows the story of Uber and AirBNB but have you seriously thought about what disruption would like for your business? Before jumping into your new space or signing the dotted line on that renovation loan it’s really important that you try to take the temperature on how people consume similar products or services. Opportunity is a tricky beast, especially when it comes to real estate decisions. Before you jump in a new space because it feels like fate dropped the space into your lap you need to think through a few questions. First, is this really the best space for you? Will being in this space make it easier for your current and potential customers to interact with you? Will the space be able to grow with you? At it’s core though this is the old “right vs right now” dilemma and the weighing of the costs/benefits of being in whatever space you’re thinking about. How you navigate this dilemma really comes down to making sure that the decision reflects the heart of your business as well as the financial needs that go along with financing your aspiring growth. The best thing you can do for yourself is to remove the emotional component of the fit and create a checklist of “must haves” for the space. That way, no matter how serendipitous something feels, you can use your checklist as a guiding light to ensure that you’re really making the best decision for your business. Growing a business is tough. It’s hard enough as it is to fight for the attention of your audience then get them to trust you enough to buy from you. Don’t make it even harder by jumping into a space that leads you to transferring your financial stress on to your customers. When you make the decision to expand into a physical space it’s important to remember that your decisions should be enhancing the customer’s experience, not taxing it. Just because you drop a fro-yo spot in a popular shopping plaza doesn’t mean you’re entitled to the foot traffic - RIP Let’s Yo! East Longmeadow. Struggling to decide on whether or not growing into a new space is right for you? I have something that might help. Sign up with your email address to receive your FREE Disruptive Decision Framework. I designed it to help you through tough decisions just like this one.